The winter of 1990-1991 saw rather dry and cool weather, the vines being deprived of water for most of that normally wet season. However, in March of 1991, California experienced numerous days of rain and this helped keep the vines alive. The summer was rather cool, so vineyards which were cropped somewhat greedily were at great risk of not maturing properly. The moderate climate meant the grapes retained rather nice levels of acidity, with the harvest for late-ripening varieties such as Cabernet Sauvignon commencing, generally, towards the end of September. Most vintners had the chance to pick good quality fruit at maturity and were able to produce wines for which they held hopes of great promise. 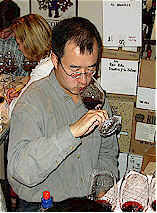 Greg Bellow was able to coerce enough tasters to part with a bottle of some 1991 vintage California Cabernet Sauvignon to coordinate this tasting. A clear winner was established and so was a clear "slacker." 8th Place: BEAULIEU VINEYARD "Private Reserve"
A few tasters detected an "off" aroma in this wine, some people finding it vaguely musty. One would think, though, for a bottle of wine of this age, had it been "corked," that mustiness would have been more pronounced. One taster found this to offer a "chocolate mouth-feel, but it's light, bitter and hot on the nose." Another person found it to show "a lot of oak, chocolate notes with some complexity, currants, cigar box, earth and brick aromas." Someone else found it to be "very mature with metallic notes and some vegetal tones...overall, a wimpy finish and no 'punch' at all." Other adjectives included "tart" and "chlorine." I found some herbal notes and a slightly earthy. cellar aroma. It's a pleasant wine, but hardly profound and not worthy of the "reserve" designation (if we take "reserve" to mean something grand). This can be held for a few more years, but it will remain on its modest plateau for 3-6 more years. 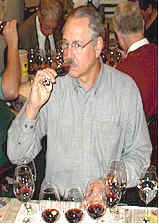 7th Place: DEHLINGER "Russian River"
"This wine shows aromas of bell pepper, all the way through." said one taster, adding "it's too vegetal!" Another person found a "strange, herbaceous streak with some black cherry notes, currants, hints of forest floor and mushrooms..." Someone else felt it started with an odd nose, but became more tolerable with airing. Another found it to be "too acidic," while someone else felt it had a "significant sour point." One critic found aromas of "burnt rubber tires," while someone else criticized it for its "short finish." I found herbal, tobacco leaf aromas with a significant vegetative theme here. There's a hint of oak, but the flavors are herbal, slightly minty and the wine still shows a significant level of tannin. I'm not certain there's sufficient fruit to carry this through and while not an unpleasant wine, you have to be appreciative of the "green" notes to be enthusiastic for this wine. 6th Place: SILVER OAK "Napa Valley"
One person described the nose as being reminiscent of "buttered popcorn." Someone else said it shows lots of "furniture grade oak!" One critic felt this wine is "thin." Someone else said it's "almost like a dessert wine with that sweet, oaky bouquet and flavor...the oak, still being as pronounced and fresh as it's showing is impressive." Another critic found this to be "crisp, earthy and having hints of cotton candy and dill-laced pickle nuances." Others agreed with the "dill pickle" reference, with other descriptors including "thin, light and diluted," while someone else found "licorice notes" and another fellow found it to have "pear and melon notes." I found lots of the American oak, dill notes in this wine. The color is a bit lighter than most of the others, but Silver Oak used to mature its Cabernet for a slightly longer time period and this may rob the wine of some of its depth of hue. I found a spice note, too, reminding me a bit of the sweet fragrance of ginger bread. The lumber is on display in the mouth, the wine having lots of dill and wood notes. It's still got some tannin, so several more years in the cellar are not out of the question. I gave this a two star rating (3 star scale, no stars being 'standard' and 3 being outstanding). "Over wooded, flat, short and bitter." said one critic. Another felt the wine showed the leathery notes of Brettanomyces. One fellow found this to be "elegant and polished, with rich mocha, chocolate notes and plum and black cherry fruit." Someone else keyed on what they perceived to be a "stinky" note of "mountain fruit and it's got a huge, huge mid-palate impression being big and rich." One taster asked whether or not this was a French wine, while someone else described the nose as being reminiscent of Band-aids. I found a mild olive-like fragrance with a rather earthy quality. It seems more Merlot-like in its ripe fragrances and there's a smoky character on the nose. It is rather nicely evolved. On the palate it's a bit rustic, showing earthy notes and a bit of tannin. I've never been a fan of this wine, so I have to say it's evolved much more handsomely than I would have imagined. It may be left in the cellar for another 5-10 years. One-and-a-half stars. 4th Place: A. RAFANELLI "Dry Creek"
"There's some rich cinnamon here, with a tart cherry character...this has a lot of life!" said the first critic. Another person found it to be "well-structured, but having more tannin than fruit." Someone else found some "slightly medicinal notes, but rich, concentrated, black 'mountain fruit' notes with currants, black cherries and plums...but it has a disappointing, tart finish." I found the nose to be very enticing, showing black currants and berry and cherry notes. There's a nice touch of wood present, as well. The wine is rather rich, still a bit tannic and has nice fruit on the palate. Holding it for another 5-10 years is not out of the question. The nose offers a bit more promise than the palate. One-and-a-half stars. 3rd Place: VON STRASSER "Diamond Mountain"
"Lots of raspberry notes here and mixed fruits." said one taster. Another felt it is a "very fine wine." A third taster found "mint and eucalyptus notes," while someone else described it as "rich, supple, elegant, with currants and a core of chocolate, but it dissipates on the finish." Another critic described it as having notes of "dried cranberry and it's fairly tannic." For me, the nose was reminiscent of the "sweet" fruit you often encounter in wines from Australia. I found it to show fragrances which reminded me of blueberries and candied violets. The wine is still quite youthful, being rather tannic and astringent and hard-edged. For all that nice fruit on the nose, the wine is yet to resolve its tannic edge and still needs 5-10+ years of cellaring. One to one-and-a-half stars.
" So powerful and green pepper-like." said one critic. Another found this to be "bold and rich, with tiers of plums and charcoal notes...but there's something 'off' in this wine." One taster described it as having a "barbecued fruit character." 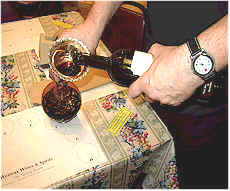 Another participant found "currants and cassis, with substantial complexity but it's not acidic enough for my palate." Someone else felt it is "too mature, with vegetal, canned pea tones which remind me more of certain Bordeaux wines." Another found this to be "substantial and well balanced, but I don't care for the herbaceous nature of this wine." Yet another person questioned if this had a significant percentage of herbal Merlot, but upon learning it is sold as a "Cabernet Sauvignon," felt this wine demonstrated a "problem in the vineyard when you have that much 'green' or vegetal character in the wine." I encountered an aroma of green beans, tobacco, leafy, herbal and a touch of oak. It's rather ready to drink, being softer and more rounded on the palate. It would be a nice wine for vegetarian cuisine, but I wonder what about what I find to be somewhat immature fruit (veggies) attracted the winemaker to designate this as a "reserve" wine. Their back label describes the wine as having intense "cherry/raspberry" notes, so apparently they were tasting a different wine than we had! One star (if you like tobacco or green leaves). 1st Place: CAYMUS "Special Selection"
"This wine is very rich and shows fragrances reminding me of apricot and cherry, being very complex with its 'dark' character...a very profound wine!" said one panel member. Another felt this is an "elegant wine and it's so well put together." Someone else pegged it as "well-rounded," while another taster said it "Totally stood apart from the rest of the wines." "This is a great wine, showing great depth of fruit and it's very complex." said one admirer. "Nice oak and toasted wood notes." said one, while someone else felt this was " the best balanced wine of the tasting." I found the nose to be mildly cedary and woodsy, with dark cherry and plum fruit notes underneath. On the palate those same features shine brightly with a bit of tannin, but beautifully balanced between the fruit and astringency. Two stars +. You can enjoy this now and it ought to go another 5-7 years.